I am Chinese American. I married a Korean American. I think you can probably say we're the perfect mis match. He's the perfect Ying to my Yang. I adore Korean food, he'd rather have Chinese food any day. He wears T-shirts and shorts in the winter time, I'm in sweatshirts and covered in fleece till June. But together we enjoy traveling and watching Better Call Saul, and these Korean Hotteok Donut Twists! There are only a handful of things I make that impress him or elicits the ever coveted "ooooo." One of those things is a Red Bean Roll Cake. Which I will be posting about in the near future! And the other thing Is this Korean Donut or Kwebeagi. I'm not sure if I'm even saying that right because thats not what he calls them. He just calls them "Baang" or "bread" in Korean. He calls everything in a Korean bakery "Baang" so I don't know what he's talking about most of the time. To put it nicely, he's not the first person I would call for Korean lessons. But this is what he likes, so this is what I'll make. I've learned all my Korean cooking from recipes I've found online on from my friends. To get into my mother in law would take a whole other blog. So when I found this recipe from Maangchi, my husband was seriously excited. I'm not exactly sure what makes it a Korean donut since the ingredients were all things I already had in my kitchen, but it's a yeast risen dough thats deep fried...and then coated in cinnamon and sugar. Sounds good so far right? But I decided to change it up a bit. There is a Korean snack called Hotteok which is a panfried pancake with brown sugar, cinnamon and nuts melted on the inside. So to pay tribute to this snack that I adore, I coated the outside of these donuts with what normally goes on the inside of the Hotteok! Hot and crunchy on the outside, soft and chewy on the inside. Sweetened with a mix of brown and white sugar, cinnamon and crushed roasted peanuts. Trust me. Make these Korean Hotteok Donut Twists! You won't regret it. How can you not want to eat that!? Mix all the topping ingredients together in a paper bag. Set aside. Melt butter in a small saucepan over medium heat. Remove from the heat and add milk, sugar, and salt. Mix well until everything with a wooden spoon till it's well dissolved. Add the egg mix well. Add the yeast and stir. Let it sit for 5 minutes. Cover with plastic wrap. Let the dough rise until it doubles in size, about 1- 1½ hours. Punch down the dough to deflate it. Knead the dough for a few minutes until it’s soft and smooth. Cover again and let it sit for 1 hour until it doubles in size again. Uncover the dough and knead it for a few minutes with a bit of bench flour. Divide the dough in halves till you have 16 equal pieces. Shape the dough balls by rolling it out on your cutting board so it forms a rope about 10 inches long .Once you reached the right length, roll one end of the rope up while rolling the other end with your other hand downward. This will create a twist. Lift both ends of the dough and let it coil around itself. Squeeze the end to seal and place on a floured baking sheet. Let rise for 30 minutes. 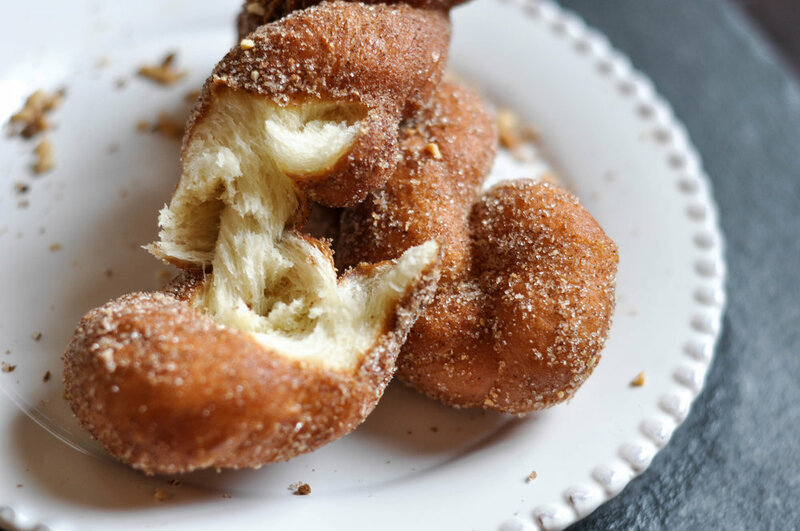 To prevent the donuts from becoming flat on their bottoms, gently flip donuts 15 minutes into this rise. Once risen, heat a pot of oil to 350F on high heat. Reduce the heat to medium and gently drop the donuts one by one into the pot. Careful not to crowd them. Fry till golden brown then flip and continue to fry till the other side reaches the same color. Approx 5 minutes. While they're still hot drop them into the paper bag with the cinnamon sugar peanut mixture and shake till they're fully coated. Enjoy warm. But who are we kidding these donuts are amazing cold too!